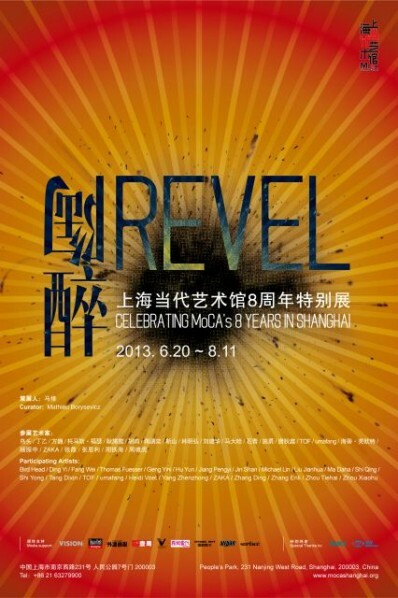 In order to celebrate the Eighth anniversary of Museum of Contemporary Art, Shanghai (MoCA Shanghai), MoCA is inviting a number of artists to present ‘Revel——Celebrating MoCA’s 8 Years in Shanghai , which is intended to showcase the development of contemporary art in Shanghai by iconic artists. These artists are highly representative with a diverse range of age, and are regarded as the elder, middle and young generations. Among them are native Shanghai, as well as outsiders who have been living in Shanghai as their second home, and even foreigners. When these artists bring artistic vitality to Shanghai and MoCA, they also blend Shanghai’s unique cityscape and humanity into their creations. Courtesy of Museum of Contemporary Art, for further information please visit www.mocashanghai.org. SNAP presents "Cui Shaohan–Consciousness Never Sleep"
Previous postSolo Exhibition by Liu Zheng: Dream Shock at Three Shadows +3 Gallery Next postWhite Box Museum of Art presents "Tenth of a second: Ma Liuming solo exhibition"